Hi guys! Happy summer! 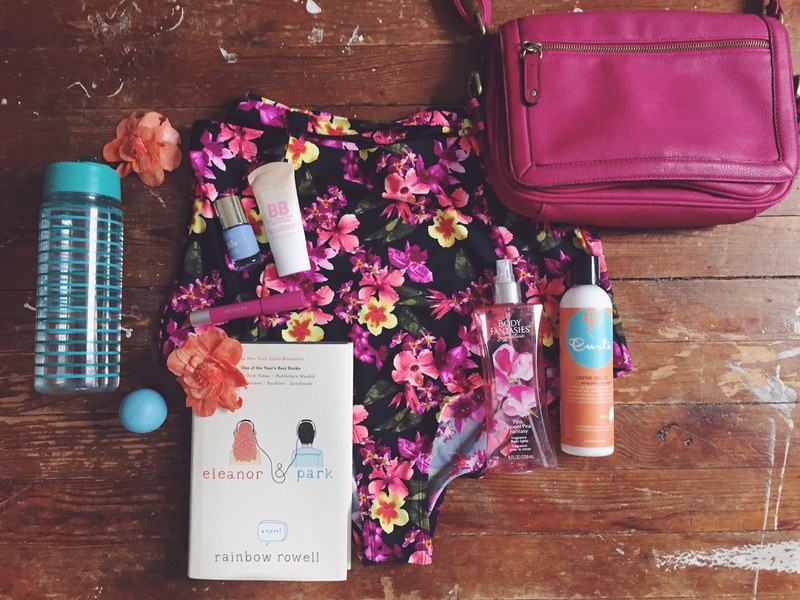 It is starting to get really hot where I live so I thought it would be fun to share my summer essentials. Below I’ll be addressing everything in the picture along with tips, and just some things I enjoy! Water: I don’t know about you but I used to have a hard time getting myself to drink enough water everyday. Obviously we all know drinking water is super important, especially in this warmer weather. A trick that motivates me to drink more water is to get a cute bottle to drink it out of, as silly as that sounds! It really does help me! (Also, I love adding some lemon or strawberries to add flavor.. so good!!) My water bottle is from Five Below. Light Makeup: I usually don’t wear foundation regardless, BUT in the summer it is especially nice to go for a light weight BB cream or tinted moisturizer. I love the Maybelline Dream Fresh BB Cream. Its also so great that it has SPF which is nice because it is extremely important to protect your skin and face from the sun. Bright Colors: Spring and Summer are the perfect times to show off all those pretty bright colors! Some of my favorite ways to play with vibrant colors is on my lips and my nails. The lipstick featured is the Revlon Colorburst Matte Balm in “Showy Flamboyante” -such a pretty fuchsia shade! The nail polish is by Milani in “Peri-wink”, which I just featured in my last post but I just can’t get enough of this color!!! Small, Easy-to-carry Purse: I am obsessed with cross body bags. I usually don’t wear them in the cross body style- I just throw them over my shoulder- but I love the long strap. In the summer, especially if you’re at a park, on vacation, or doing a lot of walking, this style is so easy to wear! My bags are usually all black or tan, so when I saw this gorgeous berry color I had to get it! This bag featured is from Target. Bathing Suit: Of course, everyone needs a good bathing suit! This high-waisted floral bottom is from Forever 21. I’m currently on the hunt for a top to go with it, but I am absolutely in love with these bottoms. Its so important for me to feel comfortable in my bathing suit. So go on a hunt for that perfect bathing suit that makes you feel the most confident!